No garage – domestic or commercial – can be without a high quality, long-lasting trolley jack or axle stands. Both are integral pieces of garage equipment for safely lifting cars and other vehicles. There’s no room for compromise when it comes to purchasing the right products for the job. So that’s why we’re proud to offer a superb trolley jack and axle stand range. But your time is precious. Why spend it shopping around for individual products when you’re able to find everything you need in one single place? Our range of trolley jack and axle stand sets are designed to get you the best products at an affordable price, whether you’re just starting out or you’re in search of replacement jacks and stands for your garage. Find the car jack and stands your garage needs with us today – all part of one equipment set. From a heavy duty industrial bottle jack and ratchet axle stand set, to our 2.5 ton aluminium racing trolley jack and four axle stands, you won’t go wrong with SGS. We have the jack and axle stand set to suit virtually everyone. DIY car repairs? Motorsport enthusiast? Professional mechanic? No matter what your requirements, our team is here to get you what you need. You can be sure that any car jack and stands you buy from SGS is of the very highest calibre for safety and durability. Our trolley jack and axle stands feature robust steel frames and are European CE marked and German CS certified. Our lightweight jacks, meanwhile, are created from aluminium and can stand up to even the most demanding of jobs. More importantly, all our car jack sets are affordable and offer exceptional value for money. 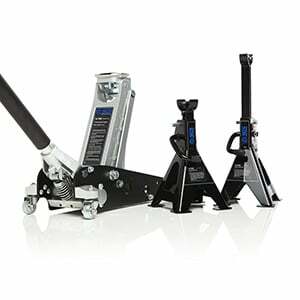 With SGS, you could receive your new trolley jack and axle stands and start using them as soon as tomorrow. Our free Next Working Day delivery service is available to most of our UK customers. Simply order your jack and axle stand set before 4pm and we’ll take care of the rest. The SGS team is here to answer any questions you have. Just get in touch and our equipment experts will be happy to help. You can also rest assured knowing your car jack and stands are built to last. And we’re happy to offer a two-year warranty as standard for your peace of mind. The right equipment can make lifting and working under a car much easier, but it also makes it safer too. With our expert how-to guides, let the SGS team help you complete lifting jobs and ensure your garage is safe place to get your work done. Not sure which type of jack is the best fit for your garage? We can help you decide. There can be more to your garage equipment requirements than first meets the eye. Read this guide to find out more. Not a qualified mechanic? It doesn’t have to prevent you from looking after your car. This guide explains the basics.